Magna International played key roles in the Mercedes-Benz CLA’s interior and exterior. The Canadian supplier provides the car’s body structure and stampings, front and rear bumpers, radiator grilles and various other trim parts. Mercedes credits several Magna-supplied components for helping to make the CLA 180 BlueEfficiency edition one of the most aerodynamic cars in its class. The BlueEfficiency version of the coupe-styled sedan has a drag coefficient of 0.22. At launch, that was the lowest of any series production passenger car, beating the previous best of 0.25 achieved by the Toyota Prius. Magna also contributes to the CLA’s driver assistance system, which uses the supplier’s eyeris image vision technology. The use of radar and cameras enhance occupant safety by working with features including blind spot detection, lane keeping assist, adaptive high beam assist and collision prevention assist. The latter is able to carry out autonomous braking at speeds of up to 200kph. 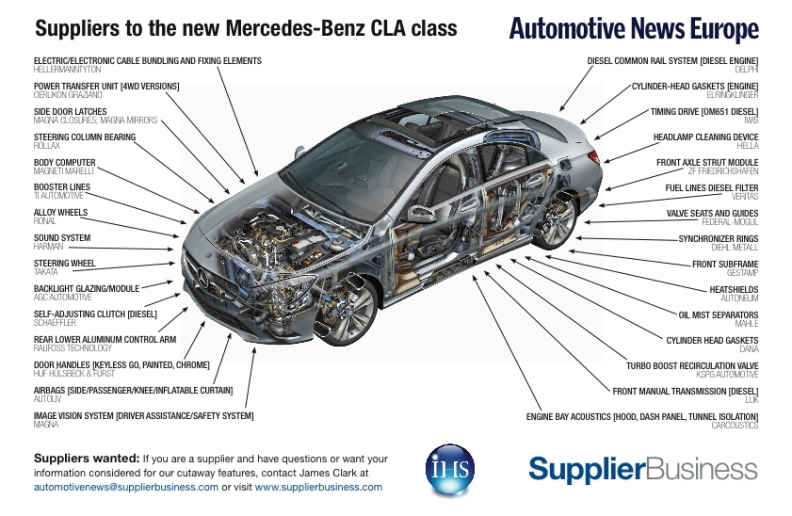 The new CLA is assembled on Mercedes' MFA platform, which also underpins the new-generation A- and B-class compact models. CLA production began in January 2013 at parent Daimler's factory in Kecskemet, Hungary, alongside the B class.